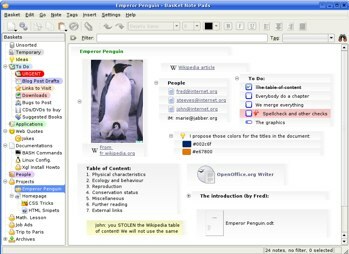 Chandler – An information management application for personal use or small group collaboration. 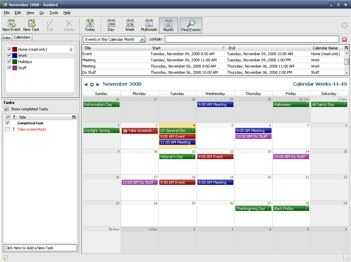 Includes integrated calendaring, data organization tools, and allows backup and data sharing via web access. Tomboy – A cross-platform note-taking application packed with features text highlighting, font styling, inline spellchecking, and more. BasKet Note Pads – More than just a note-taking app, BasKet lets you organize in track data in several different ways, import information from other apps, and easily share your notes with others. 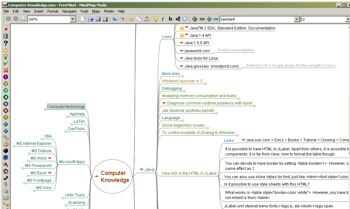 Freemind – This free mind mapping app can easily handle maps with as many as 22,000 nodes. Easily import and export existing data to and from Mindjet Mind Manager or Microsoft Office and transfer maps to your mobile device. Task Coach – A robust todo list tracker. 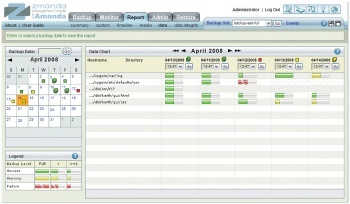 Users can .et tasks to alert or reoccur, sort by attribute, view by list or as a tree, and more. Works in tandem with Thunderbird email client to create a new task, and add files, emails, and URLs as attachments via drag and drop. 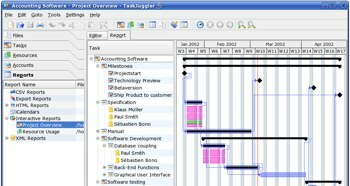 TaskJuggler – Full-featured project management app that includes an an optimizing scheduler to analyze project outlines and various user-provided constraints, then build project time lines and assign resources based on the data. Sunbird – Standalone calendar application with a tiny footprint, perfect for use on a computer that’s tight on memory and disc space. 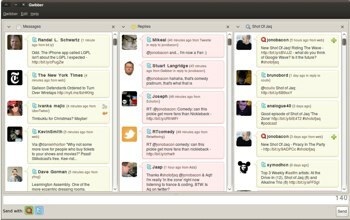 Gwibber – Microblogging client for GNOME that supports Twitter, Flickr, Digg, Facebook, and more. Elgg – A social networking platform that allows users to create their own social environment. Perfect for businesses, volunteer organizations, and educational institutions. 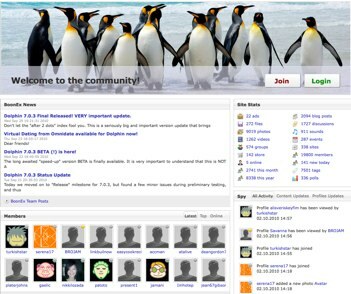 Dolphin – Build your own social networking community that pulls in data fom Facebook, Flickr, MySpace, YouTube, and more. It’s an all-in-one package of scripts and apps that makes it super easy to build and launch a custom network in just a few minutes. Songbird – A music and video manager for Windows, this app has terrific search features and supports CD ripping, playlist sharing, and music purchases from 7digital. 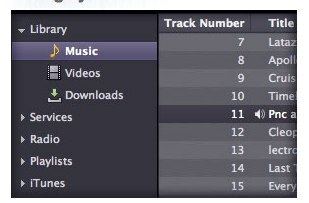 iTiVo – Downloads recorded shows to your Mac, then converts them to different formats that are easily transferred an iPod or iPhone. 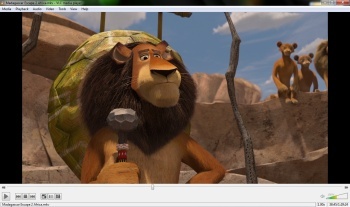 VLC – This cross-platform media player can handle files, discs, and streaming content, and just about every file format you throw at it. 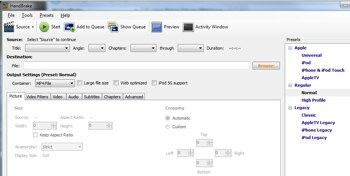 Handbrake – This popular video transcoder is great for making personal-use backup copies of DVDs you already own. Presets make it dead simple to format videos for the iPhone, AppleTV, handheld games, and more. 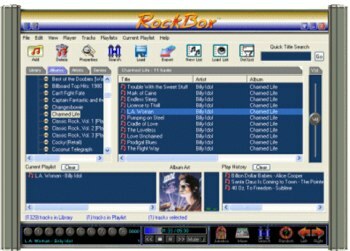 Rockbox – Don’t like the software that’s built into your portable media player? Change it to Rockbox and turn your media player into a customized pocket-size jukebox. Banshee – Play music, podcasts, and videos right on your computer, or sync them to your Android, iPod, or other handheld devices. Blender – Create amazing 3D videos with this professional-grade application. 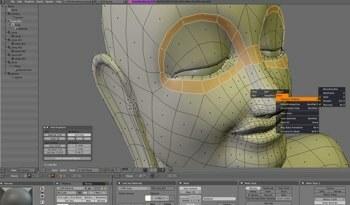 Model, shade, animate, render, and more with this tool that works on Windows, OS X, and Linux. 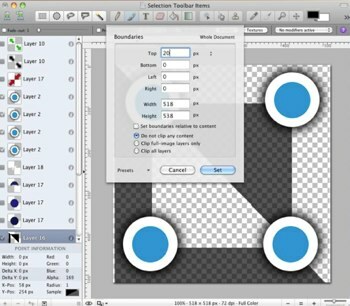 Gimp -The GNU Image Manipulation Program is great for power users and novices alike who need a tool for photo retouching, image composition, and more. Supports a wide range of photo formats. 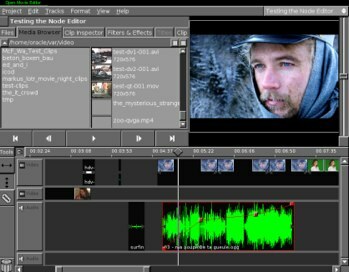 Open Movie Editor – Use this Linux-only video editing program to make movies. 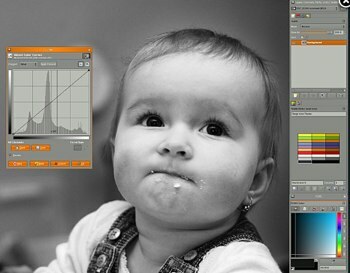 Easy to use and perfect for amatur filmmakers. 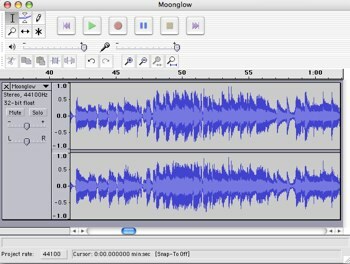 Audacity – A very popular open source audio editor used to make podcasts, create ringtones, remove vocals, and pretty much anything else you want to do with sound files. Seashore – Use this Mac-only photo editor for simple picture touch-ups or full-blown editing projects. Use the doodle feature to draw freehand. 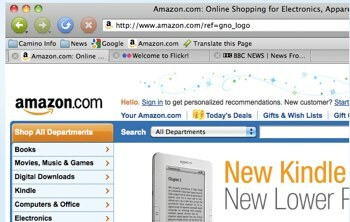 Camino – A great alternative to Microsoft Explorer, this open source browser was designed specifically with Mac users in mind. 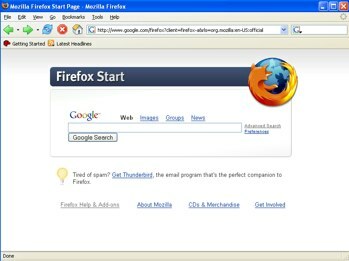 Firefox – The quintessential and enormously open source browser with a huge supply of addons and plugins to make it even better. Konqueror – A full-featured browser for those who use the KDE desktop environment. 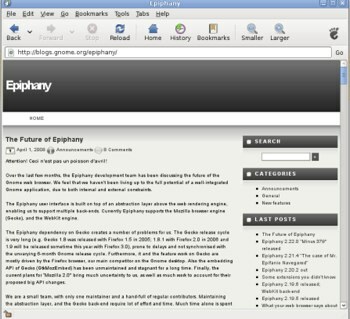 Epiphany – The browser of choice for many GNOME desktop users. 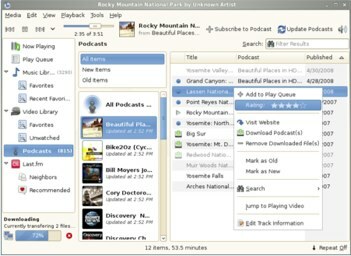 Includes a customizable interface, smart bookmarks, and more. 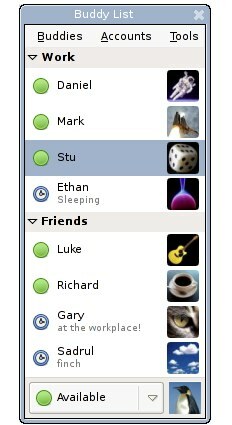 Pidgin – Cross-platform chat and instant messaging client that supports more than 15 chat networks including Google Talk, AIM, Yahoo, and MySpace. 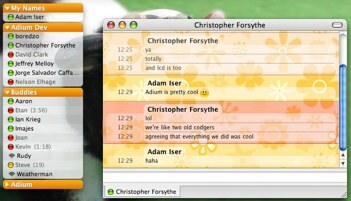 Adium – Robust instant messaging client for Mac OS X that works with Yahoo, MSN, Gmail, and more. Colloquy – An Internet Relay Chat (IRC) client for the Mac. Customizable, intuitive, and easy to use. Xchat – An IRC chat client for Linux and WIndow. Supports private messaging, file transfers, and multiple channel connections. 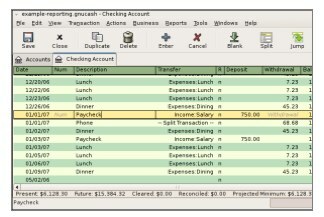 GnuCash – Ideal for small business and personal use. 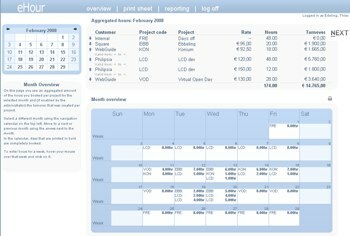 Supports reports and graphs, scheduled transactions, invoicing, and lots more. 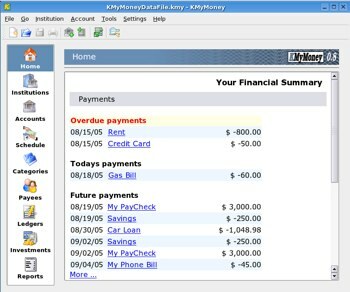 KMyMoney – A full-featured personal finance manager for use on the KDE platform. 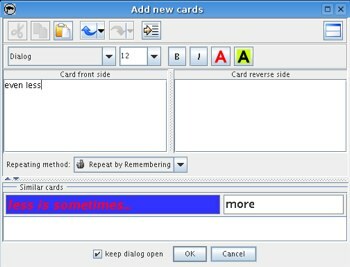 Pauker – This flash card application is available in nine languages. Dozens of card decks are available for free download, including geography, pharmacology, vocabulary, and computer-related acronyms. 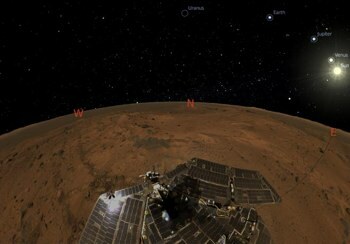 Stellaruim – An amazing astronomy app that puts a planetarium right on your computer and shows the night sky in 3D. TuxType – Enormously popular typing tutor for kids that includes two different games designed to increase typing speed and efficiency. 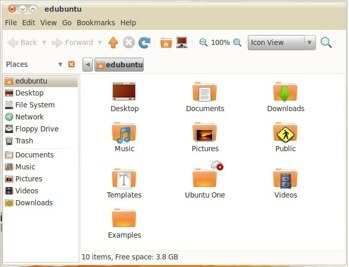 Edubuntu – A customized version of the Ubuntu Linux operating system bundled with a huge assortment of learning applications and games. 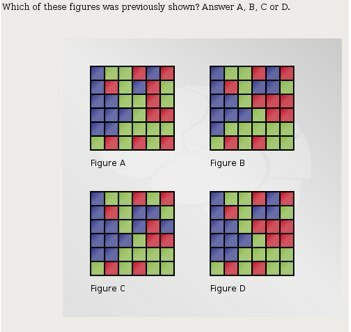 gbrainy – A brain teaser game for all ages to keep your mind sharp and your reasoning skill sound. Includes mental calculations, memory trainers, logic puzzles, and verbal analogies. 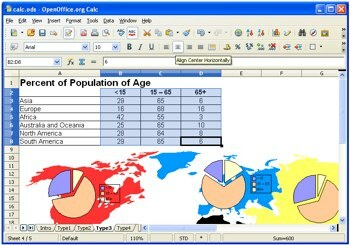 OpenOffice.org – A full suite of office applications, including a word processor, spreadsheet creator, and presentation maker. 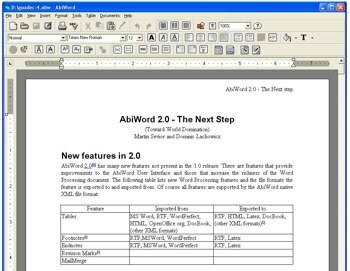 Abiword – Word processing application that’s a great replacement for Microsoft Word. Works on Widows, Mac OS X, and Linux. 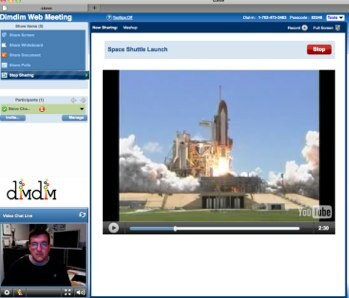 Dimdim Web-based tool for web conferencing, webinars, online meets, real-time collaboration, and more. Amanda – Backup and recovery software to help secure all your important documents and data. eHour – Web-based time tracking software that supports multiple projects, multiple uses, and different hourly rates per client. Easily exports data to Microsoft Excel. 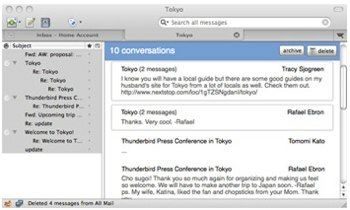 Thunderbird – Extremely customizable email client that includes message archiving and search, filters, and a one-click address book. The integrated Migration Assistant makes it dead simple to import existing data from other email clients like Microsoft Outlook or Outlook Express. OpenProj – Use this project manager to create charts, graphs, and all kinds of reports to help keep your home office running smoothly. 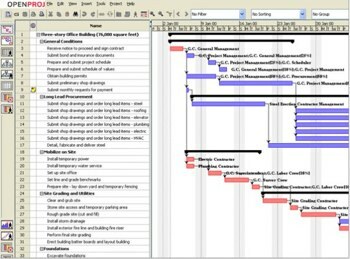 Supports budget data, time lines, Gantt charts, and resource management. Scribus – Professional-grade desktop publishing system that’s great for turning out media-ready page layouts. 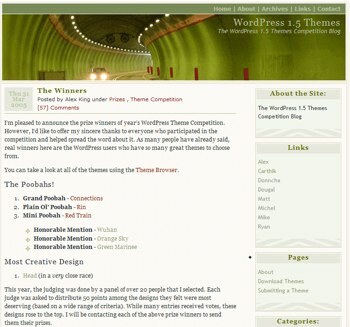 WordPress – Available in both a server-based and hosted version, WordPress is one of the most extensible, user-friendly, and full-featured blogging platforms on the market today. 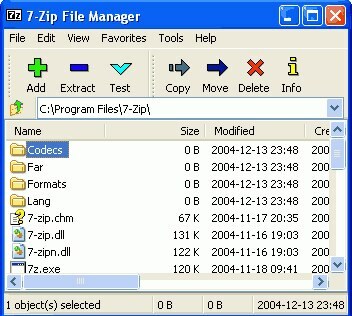 7-Zip – Use this file archiver to compress files into ZIP files for easy emailing or to save storage space on your computer’s hard drive. PDF Creator – If you create a lot of PDF’s you’ll love this app. Use it to easily create PDFs from any Windows program or convert files on your computer’s hard drive into a PDF format. Prey – A small security application that runs on Linux, Mac OS X, and Windows. Use it to track your laptop via geo-location in the event it gets stolen and use it as a gateway to communicate with the person who stole your computer by sending onscreen messages and triggering alarms. KeePass – Secure password manager to keep all the passwords on your system under lock and key. MediaWiki – A server-based full-featured wiki with support for multimedia and image management, multiple themes, and more. Ideal for large groups and busy websites. Please contribute your more knowledge and share more open source software …. I suggest also MyPaint, a very cool drawing application. You could add a fine software installer. 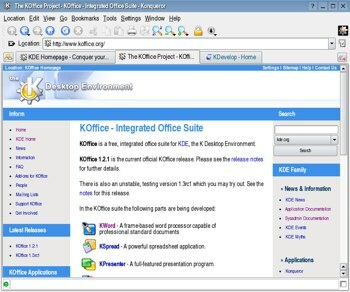 Several of these applications require the mono runtime be installed on your computer to run. Before you add that you might want to very sure the mono licenses meet your (and your boss’s if at work) needs. Can’t use them here as mono is banned. @Jesper: for Windows there is http://www.theopendisc.com/, for Linux you don’t need that, just use the normal package management/application installer (apt-get, yum, whatever). I am posting this from my work laptop, running Ubuntu 10.10. 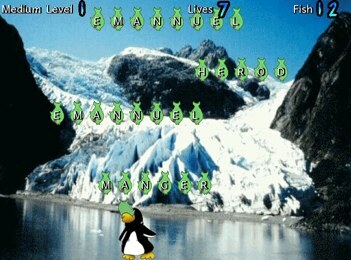 I like FOSS and want to see it succeed. On the other hand, be careful when you encounter lists of software like this. All is not as it may first appear. I don’t follow all of these projects, but Chandler and Handbrake have been silent since 2009. AFAIK, neither is experiencing heavy development and it is possible one or both may eventually die. Before you download and become dependent on a piece of software — ANY SOFTWARE — Take the time to do the necessary research. Freeware is better quality IMO than “Open Source”. Freeware does not matter on the type of copyright, authors, etc. It is functional – sometimes called crippleware, nagware, demo-ware & sometimes commercial (if commercial obligations are never enforced). Opera internet browser is officially sometimes considered commercial, but for decades, I have never paid nor registered on any of my computers (including Symbian & Android). The best ever “freeware” is not officially labelled as such: OPERA browser – most web-compatible, fast (not the fastest), spell-checker, inbuilt macros, downloader, ad-block, instant-save MHT files. In the MHT (compressed, TOTAL web page, in ONE tidy file), it is the ONLY internet browser capable of instant storage. Of ALL the internet browserss, it is the only one usable on every popular operating system: M$ Windows, OS-X, Linux, Android, Symbian, etc. For post-it and quickie notes, I have always used xpad. Nifty little app. Have you ever considered using SSuite Office’s free software? i like Blender very much it is owe some…. good job! Please help me in doing a program in turbo c that will calculate the mean, median and standard deviation. 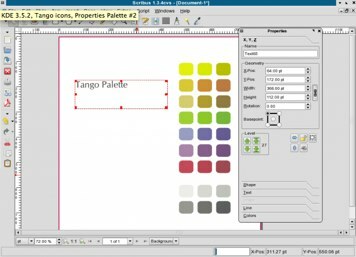 What about Photoscape – the simple to use photo and batch editor? I can’t recommend FreeMind as historically it had data integrity issues. Selecting one node may result in editing a completely different node than one had selected. Still, it is the standard for exporting and importing to other Mindmap tools. Personally, I’d recommend Xmind for a free mind mapping tool. It isn’t open source, but the interface is a lot easier to work with and it has less data integrity issues. I ended up not using Xmind and switched to standard note taking tools. In the media group, love VLC as it supports so many codecs (depending how it is built)..still needs a bit of work on the encoding side (so I use FFMPEG for that with command line). That being said, while I liked Handbrake, it’s build system was nuts, so this is another reason why I use FFMPEG. I don’t use the above movie editors, but I do use Kdenlive, which through one of the open source build systems makes a good cross platform for Mac as well (but I use it on Linux primarily). Definitely recommend Audacity for audio editing. Great for adding/importing/exporting certain audio, not to be confused for a full studio tool, however. Firefox and Konqueror have been my favorite browsers forever, and while Firefox does not have Flash support like say Chromium does, I still prefer it and its extensions, I’m a bit biased. I don’t use Konqueror as a web browser, but when combined with Dolphin, the KDE file manager, it makes a greaf fully featured file manager as it can open WebDAV, SFTP, SAMBA, FTP locations using KIoslaves. One can integrate its bookmarks with the terminal program “Konsole” as well, which is handy from an administrative perspective. For Chat, I still lean towards Pidgin. I’ve used it for years, and it has so many protocols supported, not to mention it supports the idea of metacontact support where one can mix the same contact together from different protocols. Additionally, it supports IRC. The only other competing messenger I would recommend would be Franz, but essentially one is using Chromium libraries to present several chat protocol websites into one app. On Financial, I would recommend GNUCash, although some behavior it has (auto completion of descriptions, etc) has gotten worse over the years. On the office productivity, I switched to LibreOffice over OpenOffice. Similar code base, but I haven’t had a compelling reason to leave LibreOffice. Definitely recommend Thunderbird as I’m able to have connectivity to Office365 with calender support working with it. Some older commercial plugins give calender access as well, but I can’t recommend it. 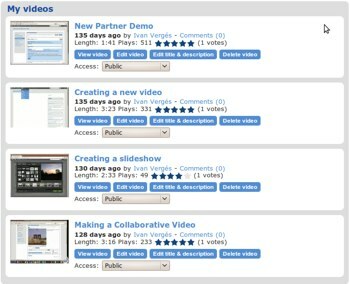 I can’t say I would recommend OpenProj, as it isn’t very intuitive and I was not able no navigate it well. That being said, I’m not strong on PM concepts. I can’t say I would recommend KeePass, but rather, KeePassX for the same purpose. Make sure to use the 2.0 alpha branch which should be marked more in the beta arena as it hasn’t presented any problems after years of use. I would also recommend MediaWiki as it is exceedingly extensible and makes a great wiki system. I prefer it over Dokuwiki. Finally, to refer back to my previous note taking tools, I currently think Laverna is a decent tool. KeepNote and TagSpaces would be close contenders, but KeepNote does not appear to be maintained, and TagSpaces has a terrible tagging system. Main complaint with Laverna is it saves its data in one’s Chrome/chromium settings directory.